In this study, Artemisia biennis was seeded in a greenhouse and raised to an average plant height of 100 cm. Aboveground plant portions were harvested and partitioned into leaves and stems, and dried; while roots were either removed from some soil (soil – roots) or left in soil (soil + roots). Greenhouse studies were conducted to evaluate the allelopathic potential of A. biennis leaves, roots, and stems; and soil – roots, and soil + roots on Solanum melanocerasum plant height and fresh weight plant–1. When 5 g of root and stem biomass were added to soil, S. melanocerasum plant height and fresh weight plant–1 was reduced by 75 and 88%, respectively. In contrast, 5 g of leaf biomass caused an increase in S. melanocerasum plant height and fresh weight plant–1 by 35% and 43%, respectively; whereas, 20 g of leaf biomass depressed both variables by 50% and 65%, also respectively. Plant height was more suppressed when S. melanocerasum grew in soil – roots as opposed to soil + roots, whereas fresh weight plant–1 was similar between soil treatments. S. melanocerasum plant height was reduced by 70 and 55% when grown in soil – roots and soil + roots, respectively. In contrast, S. melanocerasum fresh weight plant–1 was reduced by 76% in both soil treatments. The reduction in S. melanocerasum plant attributes in this study is indicative of the allelopathic potential of A. biennis. Furthermore, A. biennis allelopathy is differenttially expressed among plant parts, primarily in roots. This may explain how A. biennis is capable of dominating a habitat once it becomes established. The presence of extractable compounds with herbicidal activity could increase the potential usefulness of A. biennis. Artemisia biennis is native to northwest U.S. and western Canada  and has now spread and become a problem in several crops in the United States, Southern Canada, and Europe [2,3]. Originally classified as a biennial weed of meadows, roadsides, and waste areas [1,4], A. biennis infestations became larger in size and more frequent in cultivated fields in the 1990s [3,5]. The successful spread of A. biennis has been largely attributed to the production of numerous seeds, estimated to be between 400,000 to one million per plant [4,5], which are very small and easily spread by wind or water. A. biennis can form large patches that can adversely affect surrounding vegetation and which is suspected to be via its allelopathic potential. Allelopathic activity has been characterized among several Artemisia species, e.g., A. annua (annual wormwood) [6-8], Artemisia princeps var. orientalis , and A. vulgaris . However, unlike other Artemisia species, A. biennis has become an established weed of several cropping systems and is suspected to be expanding its habitat range which warranted its placement on a “Weeds to Watch” list by several scientists of the North Central States of the United States . Upon emergence, A. biennis appears to negatively affect surrounding vegetation via stunting which suggests allelopathy may be involved. In preliminary studies, greenhouse soil amended with aboveground A. biennis biomass reduced fresh weights of selected crops (Zea mays, Glycine max, Helianthus annuus, and Triticum aestivum) by 10% and selected weed species (Setaria viridis, Solanum melanocerasum, Amaranthus retroflexus, and Avena fatua) by 18%. Greenhouse soil containing belowground A. biennis biomass reduced crop and weed fresh weight on average by 39% and 61%, respectively [12,13]. S. melanocerasum was the most sensitive species and greenhouse soil containing A. biennis biomass from plants that were 45 cm or taller resulted in reduction in fresh weight by 65 and 90% from aboveground and belowground biomass, respectively. Seasonal variation in allelopathic potential has been reported for Artemisia princeps var. orientalis  and Artemisia annua ; and showed that extracts from wheat straw were more inhibitory to Echinochloa crusgalli germination and seedling growth than were extracts from hulls and leaves . A. biennis allelopathy can be of better utility if variation in phytotoxicity in plant parts is characterized. The objective of this study was to evaluate the allelopathic potential of A. biennis leaf, stem, and root biomass partitioned from plants, and soil used to grow A. biennis plants. The A. biennis seed used in this study was collected from mature plants in soybean fields near Fargo, ND (46˚55’N, 96˚50’W) and Fergus Falls, MN (46˚17’N, 96˚05’W), in the fall of 2000. Mature flower heads were collected and hand crushed to release the seed, and 710- and 300- µm-mesh screens (No. 25 and 50) were used to separate seed from large extraneous plant material. All A. biennis seeds collected were stored at 5 C until used. Preliminary studies were conducted in greenhouses at North Dakota State University, Fargo, ND from 2004 to 2005 using the Fargo seedlot to assess allelopathy potential (data not presented). Allelopathic potential was characterized further in greenhouses at Fargo from 2005 to 2006 using the Fargo seedlot (run 1), and at Northwest Missouri State University, Maryville, MO from 2007 to 2008 using the Fergus Falls seedlot (run 2). A. biennis was seeded in a commercial potting mix in 10-cm-wide by 12-cm-deep plastic pots, which were watered to field capacity. Approximately 150 A. biennis seed were spread on the damp potting soil of each pot. Numerous seeds were used because of the small size of A. biennis seed and variable germinability. Dry growth medium was lightly sprinkled over the seed to create a planting depth of about 2 mm, and pots were watered again. Transparent plastic was placed over the pots to increase the humidity and temperature for uniform A. biennis germination and emergence . This method of incubation resulted in relatively fast and uniform A. biennis emergence. A total of 70 pots were established and placed in a greenhouse which was set at a temperature of 25˚C ± 2˚C. Upon seedling emergence, the transparent plastic was removed and A. biennis seedlings were watered when necessary and fertilized weekly with 53 ml of a 3.7 g·L–1 solution of 15:30:15 (N2-P2O5-K2O) fertilizer. At 2 wk after emergence, A. biennis seedlings were thinned to one plant per pot. Thinned plants were uniform in height and were grown and later harvested when the average A. biennis plant height was 100 cm and plants were starting to initiate floral primordia. Upon harvesting, aboveground A. biennis plants were partitioned into leaf and stem biomass, and air-dried in the greenhouse for 10 d. Pots containing soil with A. biennis roots were left to dry for 7 d and then root biomass was removed from dry soil. The soil from 50 pots was broken up and sifted with sieves so as to remove all root hairs which were combined with larger roots to form root biomass. Soil from which roots were removed was combined and used in later experiments. The remaining 20 pots containing soil and A. biennis roots were combined and used in the soil experiment. S. melanocerasum was chosen as the assay species based on preliminary experiments. After drying, A. biennis leaf, root, and stem biomass was ground separately using a grinding mill. The ground up leaf, root, and stem A. biennis biomass was apportioned into doses of 0, 5, 10, and 20 g and each portion was mixed with 150 g of a commercial potting mix and placed in a 10-cm wide by 8 cm-deep plastic pot. Each pot was seeded with 25 S. melanocerasum seeds, watered, and placed in a greenhouse set at a temperature of 25˚C ± 2˚C and with a 16-h photoperiod under natural sunlight supplemented with high-pressure mercury halide lamps (4.7 µE m–2·s–1). S. melanocerasum plants were allowed to grow in soil amended with A. biennis biomass for 21 d following emergence whereupon plant height and fresh weight were determined. Plant height was determined by measuring each plant within the pot from the soil surface to the highest extended leaf tip. Fresh weight was determined by harvesting and weighing all aboveground plant parts from each pot. Plant heights and fresh weights from each pot were averaged before statistical analysis. Soil used to grow A. biennis plants was combined and partitioned into two portions. One portion had all roots removed (soil – roots), whereas roots were left intact in the second portion (soil + roots). For each soil, 150 g was placed in a 10-cm wide by 8 cm-deep plastic pot. Each pot was seeded with 25 S. melanocerasum seeds, watered, and placed in a greenhouse as previously mentioned. S. melanocerasum plants were allowed to grow for 21 d following emergence whereupon plant height and fresh weight were determined as previously outlined. An untreated control in which pots contained 150 g of a commercial potting mix was included. Each experiment was conducted twice in a completely randomized design and treatments were replicated three times. Data were subjected to ANOVA using PROC GLM in SAS. The assumptions of random, homogeneous residuals with a normal distribution were checked to ensure the validity of ANOVA. The amount of biomass (0, 5, 10, and 20 g) was treated as a nested effect. This was necessary to allow the model to account for differences in the allelopathic potential of equal weight of biomass from different sources (leaves, roots, and stems). In the evaluation of allelopathic potential of A. biennis biomass, ANOVA indicated significant treatment effects. Therefore, regression analysis was performed to relate amount of A. biennis biomass to number of plants, plant height and weight plant–1 of S. melanocerasum. ANOVA indicated that there was no difference between runs in the evaluation of allelopathic potential of soil – roots and soil + roots treatments. Therefore data were combined and reanalyzed and where significant effects were detected treatment means were compared using the Tukey-Kramer HSD test. The level of significance was defined at P ≤ 0.05. Results from ANOVA indicated that the addition of A. biennis leaf, root, and stem biomass to soil significantly affected S. melanocerasum fresh weight plant–1 (P < 0.0001) and average plant height (P < 0.0001). A significant effect was detected among blocks (P = 0.0189) for S. melanocerasum fresh weight plant–1 but this effect accounted for only 1.6% of the total variation. Therefore, S. melanocerasum fresh weight plant–1 data were combined and reanalyzed. ANOVA detected significant effects due to soil – roots and soil + roots treatments on S. melanocerasum average plant height (P < 0.0001) and fresh weight plant–1 (P < 0.0001). 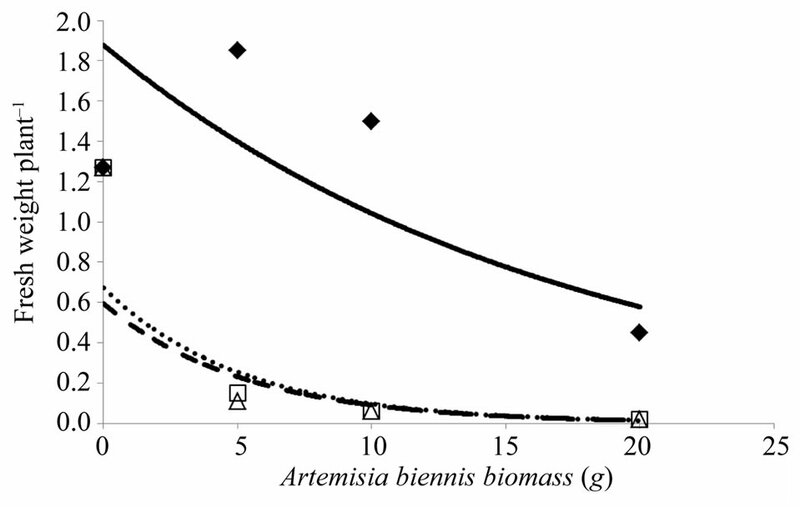 Increasing the amount of A. biennis root and stem biomass added to soil from 5 to 20 g resulted in 88% or greater reduction in S. melanocerasum fresh weight plant–1 compared to the untreated control (Figure 1). In contrast, the addition of 5 and 10 g of A. biennis leaf biomass to soil resulted in an increase in S. melanocerasum fresh weight plant–1 of 43 and 15%, respectively, compared to the untreated control. When the amount of leaf biomass added to soil was increased to 20 g, S. melanocerasum fresh weight plant–1 was reduced by 65%, compared to the untreated control. 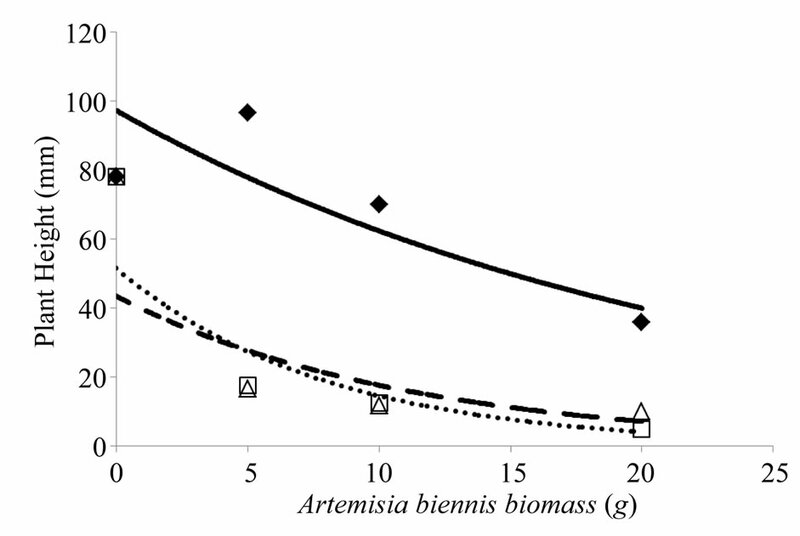 Increasing the amount of A. biennis root and stem biomass to soil from 5 to 20 g caused 75% or greater reduction in average S. melanocerasum plant height compared to the untreated control (Figure 2). In contrast, the addition of 5 g of A. biennis leaf biomass caused an increase in S. melanocerasum plant height of 35%, whereas the addition of 10 and 20 g of leaf biomass to soil caused 2 and 50% reduction in plant height, respectively, compared to the untreated control. Fihure 1. Influence of amount of Artemisia biennis leaf, root, and stem biomass (0, 5, 10, and 20 g) mixed with greenhouse potting mix on Solanum melanocerasum fresh weight plant–1 21 days after emergence under controlled environment. A. biennis rates were mixed with 150 g of greenhouse potting mix prior to seeding S. melanocerasum. Leaf biomass (♦, solid line): y = 1.8781e–0.059x (R2 = 0.64); root biomass (□, dotted line): y = 0.6732e–0.194x (R2 = 0.89); stem biomass (∆, broken line): y = 0.5947e–0.189x (R2 = 0.84). Figure 2. Influence of amount of Artemisia biennis leaf, root, and stem biomass (0, 5, 10, and 20 g) that was mixed with greenhouse potting mix on Solanum melanocerasum average plant height 21 days after emergence under controlled environment. A. biennis rates were mixed with 150 g of greenhouse potting mix prior to seeding S. melanocerasum. Leaf biomass (♦, solid line): y = 97.276e–0.044x (R2 = 0.78); root biomass (□, dotted line): y = 51.57e–0.126x (R2 = 0.89); stem biomass (∆, broken line): y = 43.482e–0.09x (R2 = 0.67). In this study A. biennis allelopathy was demonstrated and we showed that phytotoxic effects vary among plant parts with effects most evident on S. melanocerasum average plant height and fresh weight plant–1 (Figures 1 and 2). Several related species within the Artemisia genus are allelopathic. For example, extracts from A. annua (annual wormwood) leaves have been shown to inhibit growth of A. retroflexus and Chenopodium album (common lambsquarters) . Our study indicated that A. biennis leaf biomass was inhibitory to S. melanocerasum though more plant material was required to illicit the response compared to root and stem biomass. Monoterpenoids are secondary plant metabolites recognized for their role against plant-directed pathogens, herbivores, or competing plant species [6,7]. Differences in concentration of monoterpenoids in A. feddei and A. scoparia leaves and stems have been shown to vary by season . Investigation of the seasonal variation in allelopathic potential of A. princeps on the germination and seedling growth of Lactuca sativa and Achyranthes japonica . The highest phytotoxic effect was from extracts collected in July from A. princeps plants and least from extracts collected in April and October. In our preliminary study, we found A. biennis allelopathy to be highly expressed when plants were 45 cm or taller (data not presented) and that the allelopathic potential is differentially expressed among plant parts, hence supporting the work by other researchers [16,17]. Soil that was used to grow A. biennis plants for the leaf, root, and stem biomass study and from which all root material was removed resulted in a 55% reduction in average height of S. melanocerasum plants 21 d after emergence (Figure 3(a)). The soil plus roots treatment resulted in a 70% reduction in S. melanocerasum plant height compared to the untreated control. S. melanocerasum fresh weight plant–1 was similar among the soil treatments and was reduced by 76% compared to the untreated control (Figure 3(b)). A. biennis allelopathy appears more evident in the soil and perhaps is an indication of root exudation as the primary release of phytotoxins. When roots were removed from soil that was used to grow A. biennis plants and placed in new soil prior to seeding S. melanocerasum, reduction in weight plant–1 was 88% or greater and was 75% greater for plant height (Figures 1 and 2). Despite detecting a slight difference between the soil – roots and soil + roots treatments (Figure 3), potential A. biennis allelopathy was demonstrated and appears to be primarily soil-related. A. annua produces several biologically active compounds, including artemisinin, which is a sesquiterpene lactone known to be phytotoxic in vitro [6,15]. The importance of artemisinin production in plants extends well beyond allelopathy. Artemisinin is a very effective antimalarial drug due to its action against the Plasmodium spp. parasites which cause malaria . Figure 3. 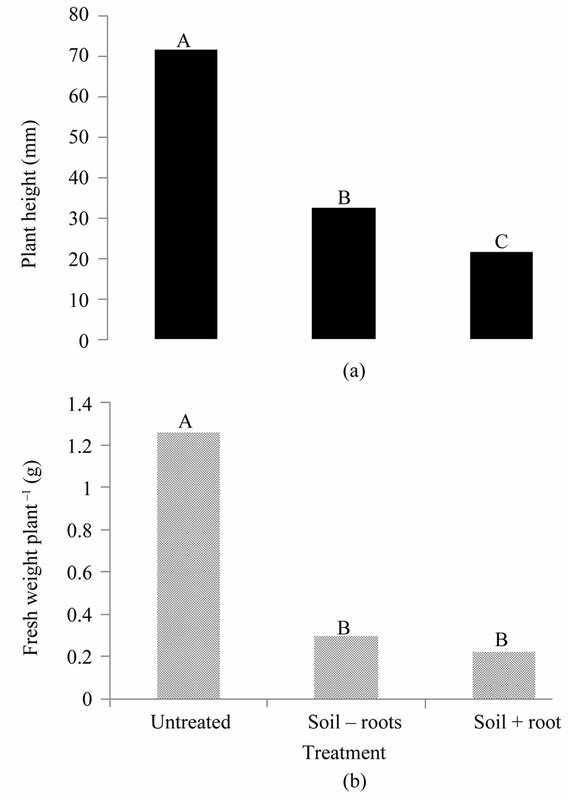 Influence of soil used to grow Artemisia biennis plants on (a) average plant height and (b) fresh weight plant–1 of Solanum melanocerasum plants 21 days after seedling emergence under controlled environment. The “soil – roots” treatment had most of the root material removed whereas no roots were removed from the “soil + roots” treatment. Bars with the same letters are not significantly different (P = 0.05). Calistemon citinus . Allelochemicals often exhibit selectivity similar to synthetic herbicides  and can offer the potential for the discovery of new molecular target sites for herbicides . Utilization of this A. biennis trait involves isolating and characterizing plant compounds that are believed to be allelochemicals. isolated artemisinin from A. annua plants and demonstrated its phytotoxic effect on several weedy species. However,  reported that soil amended with pure artemisinin was not as phytotoxic to A. retroflexus as soil amended with A. annua leaf extract, suggesting that the inhibitory effects of A. annua could not be attributed solely to artemisinin. Successful extraction of essential oils from aboveground A. biennis plant portions has identified compounds that are phytotoxic to some microbes, such as the yeast Cryptococcus neoformans, and fungi Fonseceaea pedresoi and Aspergillus niger . The presence of extractable compounds with herbicidal activity could increase the potential usefulness of A. biennis. Our research findings indicate that the allelochemicals with herbicidal activity are located mostly in the stem and root biomass compared to leaf biomass (Figures 1-3). Increased invasiveness of A. biennis is aided partially by the production of allelochemicals, which improves its ability to compete for resources. The most likely scenario is one where A. biennis plant exudates (allelochemicals) alter the surrounding soil so as to give it a competitive advantage, which is similar to the allelopathic effect of Pluchea lanceolata . Consequently, as A. biennis plants grow they produce increasing amounts of phytotoxins that prevent other susceptible species from becoming established. Characterizing A. biennis allelopathy to better understand the herbicidal activity of allelochemicals may provide new tools that can be utilized for weed management. However, once biologically-active allelochemicals have been isolated and characterized, they may not mimic their behavior in the soil . Isolated allelopathic compounds from A. biennis have been found to have antimicrobial properties  which, together with its phytotoxic effects on plants, justify further investigation. The authors thank S. Hobbie and D. Yazali (Maryville, MO), and S. Mark (Fargo, ND). This material is based upon work supported in part by Northwest Missouri State University Faculty Research Funds and by the Cooperative State Research, Education, and Extension Service, U.S. Department of Agriculture (under Agreement No. 2004-34361-14427). Hall, H.M. and Clements, F.E. (1923) The phylogenetic method in Taxonomy. The North American species of Artemisia, Chrysothamanus, and Atriplex. Carnegie Institution of Washington, Washington DC. Jehlik, V. (1984) Artemisia biennis in Czechoslovakia. Prelsalia. Academia, Praha. Duke, S.O., Vaughn, K.C., Croom, E.M. Jr. and Elsohly, H.N. (1987) Artemisinin, a constituent of annual wormwood (Artemisia annua), is a selective phytotoxin. Weed Science, 35, 499-505. Kim, J.H., (1996) Seasonal variation in concentration and composition of monoterpenes from Artemisia princeps var. orientalis. Korean Journal of Ecology, 19, 321-328. Johnson, W.G., Hartzler, R.G. and Nordby, D.E. (2004) Weeds to watch: Weeds that seem to be expanding their habitat range. North Central Weed Science Society, 59, 133. Ciernia, M.G. and Kegode, G.O. (2003) Allelopathic potential of biennial wormwood. North Central Weed Science Society, 58, 69. Kegode, G.O. and Ciernia, M.G. (2005) Biennial wormwood allelopathic potential. Weed Science Society of America, 45, 187. Lydon, J., Teasdale, J.R. and Chen, P.K. (1997) Allelopathic activity of annual wormwood (Artemisia annua) and the role of artemisinin. Weed Science, 45, 807-811. Lee, D.L., Prisbylla, M.P., Cromartie, T.H., Dagarin, D.P., Howard, S.E., Provan, W.M., Ellis, M.K., Fraser, T. and Mutter, L.C. (1997) The discovery and structural requirements of inhibitors of p-hydroxyphenylpyruvate dioxybenase. Weed Science, 45, 95-102.